It has become a familiar routine to hear Cameron plead he can reduce net migration, and for the Office of National Statistics to publish figures which reveal the futility of his efforts. Yesterday’s ONS figures reveal annual net migration – the difference between numbers arriving and those leaving – soared past 243,000, equivalent to a city the size of Southampton. 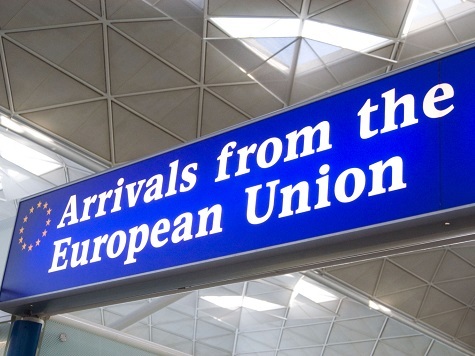 This is a massive increase of 68,000 from net migration the previous year, and two thirds of the increase are accounted for by the influx of EU migrants. Cameron’s plans are in tatters, but his claim he can reduce net migration have always been wishful thinking. As long as we remain members of the EU there is nothing we can do to control or limit European workers arriving, and Cameron knows it. This point cannot be stressed enough. As members of the European Union we have effectively signed up to suspend border controls for any EU citizen arriving on our shores. It is spelled out in Article 45 of the Lisbon Treaty which establishes the free movement of workers. You can’t opt-out of it. What the mainstream media (and Cameron) don’t want the public to know is that EU membership is a package deal, a tailored arrangement is not on the table. Freedom of movement is an integral feature of EU membership and despite the strain inflicted on our schools, hospitals and housing by relentless waves of migrant workers fleeing the beleaguered Eurozone, there is no political will in Brussels to call a halt to it. As such, attempts by Westminster to control or reduce net migration while we are in a political union with Brussels amounts to a farce. The only way to control immigration is to leave the EU and restore our national sovereignty. Britain deserves a sensible, controlled immigration policy. The current arrangement is forcing the government to crack down on non-EU migrants. We are left in the astonishing situation of having to turn away skilled and motivated workers from countries such as Australia, India and Canada, while unskilled workers from Eastern Europe are waved through customs. Downward pressure on wages mainly at the lower end of the job market is now the norm, causing devastation for low-paid workers struggling to compete with their European rivals. Interestingly, Douglas Carswell’s defection to UKIP serves to underline the failure of the EU strategy, as he has accused the Prime Minister of not being serious enough about renegotiation and has asserted Cameron has already made his mind up about staying in the EU. When your own MPs are jumping ship, it is clear your party is not headed in the right direction. It is time for Cameron to put aside his commitment to “renegotiation”, bring forward the In/Out referendum and lead the Brexit campaign to Get Britain Out. I’m not holding my breath though, are you?